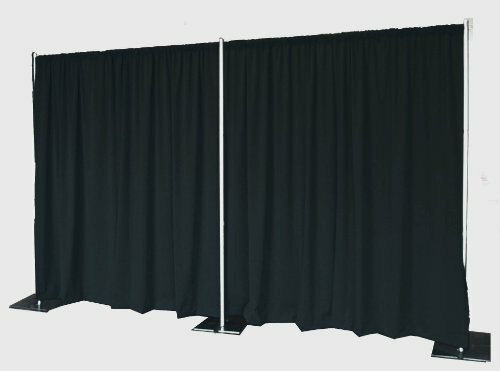 This is a portable, free standing Pipe and Drape wall, 8ft x 20ft. Includes all of the components needed. Premier 100% Polyester Drapes F/R Certified drapes are machine washable. Includes 3 8ft uprites, 3 14x16" bases/pins, 2 6-10 crossbars, and 6 60" premier fabric drapes. Single package covers 6-20 feet floor width. Combine multiple pipe and drape packages to make any width, makes 90 degree turns. Sets up in less than 5 minutes, no tools required. An affordable and portable solution for masking areas, dividing rooms, photo backdrops, and more! F/R Certified NFPA 401 and California Fire Marshall.